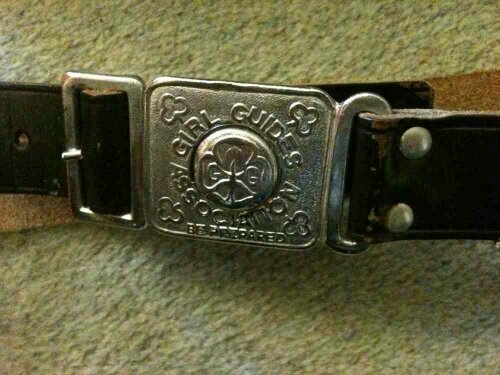 I have been a Girl Guide since I was 6 (sneakily joining the Brownies two years early as there was no such thing as Rainbows then). the new Promise, which will take effect from 1 September, the words ‘to be true to myself and develop my beliefs’ will replace ‘to love my God’, and the words ‘to serve the Queen and my community’ will replace ‘to serve the Queen and my country’. To keep the (Brownie) Guide Law. I have two main observations to make. The first is that this move from ‘duty’ to ‘love’ to ‘being true to oneself’ could read as a mini history of faith in the UK in the last 100 years. We have moved from the certainty of Modernism to the uncertainty (and subjectivity) of Post-Modernism. Or, put another way – the move from Christendom to post-Christendom. What is prized in our society now as the goal of human existence is emotional wellbeing – as Alan Billings observes in his book Secular Lives, Sacred Hearts. Hence the Queen being admired, almost as a relic of the past in her (what is now unusual) devotion to her duty. Things have moved on: people’s beliefs shift and change. Given that 44, 000 people (including me) responded to this consultation we should listen to what this is telling us about how people feel about religion and God. My second observation is that this is a great opportunity. Most people will focus on the ‘be true to myself’ new bit of the promise. To be honest I am a bit uncomfortable about that bit – what does it mean? However, the bit people probably won’t write about in the press is ‘to develop my beliefs’ – and for me herein lies the great opportunity to help girls to develop their faith. We don’t expect visitors to our churches to pledge allegiance to God or the Queen – people’s faith, we hope, grows over time in a Christian community leading eventually to the promises of baptism. What this new promise does is invite exploration of faith rather than telling youngsters what to believe. It also provides more inclusivity. Many of my muslim friends didn’t realise that Guiding was open to them – they thought it was a Christian thing – it has never been a religious organisation in the way that the Girls and Boys Brigade is. Guiding was born during Christendom and there is no doubt of the Christian foundation of Guiding but it has never been intrinsically religious as an organisation – any faith element has always been down to the relationship with the church in which the unit meets and the beliefs of the leaders. I’m not keen on the self featuring so largely in this new promise but I do like the invitation to explore faith which is an opportunity to help girls to discover faith for themselves rather than pledging allegiance to a God they don’t know or understand. What does it say about our society that after filtering 44, 000 responses that the Queen is more popular than God? I always noticed as a kid that the Girl Guides is inherently royalist (as is Scouting). The only context in which I have regularly handled union flags and sung the National Anthem has been in the Guides. It’s probably because Princess Margaret was our patron and she and the Queen themselves were both Guides. Interesting that people were more ready to drop God from the promise than the Queen. Is it a matter of nostalgia? I don’t know.